There is very little disagreement among high-level Republicans that Donald Trump is dangerously unfit for the presidency. Senator Bob Corker’s comments represent a milestone, in that a sitting Republican elected official, who has previously bent over backward to accommodate Trump, said out loud what everybody was thinking: Trump is behaving like a reality-show character, his erratic behavior threatens to bungle the country into war, and the White House has become an “adult day-care center,” whose staffers see their task as managing the child monarch. Since its very first day, when the president raged over photographs of his inaugural attendance and instructed his press secretary to tell wild lies about it, Trump’s presidency has felt like something that could not possibly last. 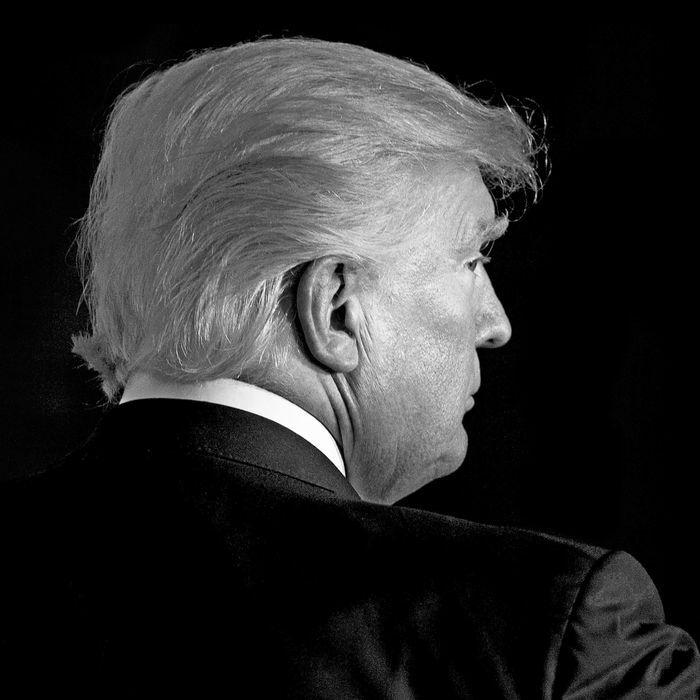 I’m going to try to chronicle this aspect of the Trump presidency in a regular feature we’re calling “Implosion Watch.” Whether it actually ends in an implosion, or explosion, or miraculous recovery, or simply hobbles onward, is for the next three-to-seven years to tell. In the meantime, it continues to be the case that the officials surrounding Trump see themselves as holding off a collapse. Politico reports that deposed former chief of staff Reince Priebus habitually used a technique familiar to parents of small children to manage the president. When Trump asked to do something stupid, crazy, or impossible, his staff would mollify the request by delaying it, on the hope that the president would forget about it later on. Explaining to him that the request could not be fulfilled would simply anger the president. A Trump confidant speaking to the Washington Post likens the president to a “pressure cooker,” who will explode if he does not blow off steam. The metaphors in the two reports differ, but they share the essential assumptions of the president’s handlers: Trump is irrationally emotional, and the only strategy for managing this problem is to try to defer the costs to the future. As with a toddler, Trump’s managers try to explain to him that his outbursts are self-destructive. (“If you can’t stop your tantrum and get dressed, we won’t have time to go to the park at all.”) Given that Trump can only afford to lose two Republican votes, lobbing insults at a senator who is already a risk to oppose his primary remaining legislative objective is an extremely bad idea. But Trump’s managers are resigned to his venting as the least-bad alternative. In a new interview with Forbes, Trump shot back at his secretary of State’s charge that he is a “moron” by challenging him to an IQ test competition: “I guess we’ll have to compare IQ tests. And I can tell you who is going to win.” Without having checked, we can probably assume that this is the first time in American history that the president of the United States has publicly challenged a member of his own cabinet to an intelligence-test competition. The head day-care-center manager in the White House, John Kelly, has had the chief of staff job for a mere three and a half months, and is already the center of near-daily intrigue. “Every day for John Kelly ends in ‘why?’” a source tells CNN. Gabriel Sherman reports that the next challenge for Kelly’s already-fraught regime are the fall and winter seasons, which will bring the president to Mar-a-Lago, where he can roam free of protocol. (Last May, Trump turned an unsecured dining room into an open-air war room.) Kelly’s strategy for professionalizing the administration is already in tatters, and Winter Is Coming.